On Monday, June 1st, many of us who work for reproductive justice will be wearing white armbands to honor Dr. Tiller, who was murdered today, and to show our support for reproductive rights. Monday evening, at 6:30, there will be a vigil in Lafayette park, in front of the White House. Please come and show that you will not accept acts of violence and terror as a part of political discourse and that peace is a choice that you will make. CALLING ALL DC YOUTH POETS! the drama diva, the goth bard, the hip hop giant, the coffee house beatnik, the funky flower child, the urban/suburban yin and yang---JUST MAKE IT SHINE!! We have 20 slots and want lots of contenders! IF YOU WANT TO COMPETE FOR A SPOT Pre-register by sending your full name, age, school, grade & email address to Lisa Pegram, Team Director at lisap@SOLySOUL.com Your place will be reserved, and you will receive more details and slam rules & regulations. * Hosting the DC Youth Poetry Slam team as they quest to Chicago July 13-19 for the 12th Annual Brave New Voices International Youth Poetry Slam (as seen on HBO). * Upon their return the team will be performing for the community at various places in DC. If you have a organization that may be interested in a performance please check with SOL y SOUL! * SOL y SOUL is a work site for Summer Youth Employment Program so we will be employing youth to learn about the artistic process and the administrative process that fuels the art! This program is through an arrangement with the DC Commission on Arts and Humanities. * SOL y SOUL's Artistic Director, REGIE CABICO is going to be everywhere! In addition to coaching the team he will be presenting several workshops and present from Howard Zinn's new piece at the Kennedy Center as a part of DC's Hip Hop Theater Festival this summer! Project Metamorphosis is an ensemble live art exhibit featuring acclaimed local artists and young women ages 7-19. This group has worked as a unit every Saturday since January to produce a seamless arts experience on the theme of Change that includes: Poetry, Photography, Dance, Theater, Vocal music, Storytelling, Garden Arts, Narrative & Documentary Film. Come wander through the many rooms, performances & displays. They will move all your senses as you witness their brilliant stories of transformation and contemplate your own. Family Friendly event, Children Welcome. Artomatic is celebrating its tenth anniversary this year. For more information on events, see the event calendar. 2008 featured poet and literary activist E. Ethelbert Miller was on the Bob Edwards Show earlier this week to discuss his new book, The Fifth Inning, which uses baseball as a metaphor for exploring his life. To hear the interview, follow the link below. Thanks to the Writer's Center for the link. SPARKLE is a queer friendly reading series held at Busboys and Poets at 5th and K (1025 5th St. NW). Hosted by Regie Cabico and Natalie E. Illum (a 2010 Split This Rock featured poet). Tomorrow, Wednesday, May 27th at 8pm, SPARKLE will feature the Baltimore Slam Master Chris August (www.slamocide.com) Chris is incredibly funny, deep, charming and ruthless at at the same time. It is a feature not to be missed. Admission is 3 dollars, and the reading will include an open mic. and support from Sol Y Soul. After SPARKLE, head over to the Black Cat to hear the young women from DC Youth Slam featured at Mothertongue. All ages are welcome, and admission is 8 dollars. Proceeds will help send the DC Youth Slam Team to Chicago to represent DC in the 12th Annual Brave New Voices International Youth Poetry Slam Festival. The show, hosted by Danielle Evennou, starts at 9:00 p.m. and will include an open mic, too. Poet Allison Hedge Coke ( a featured poet at Split This Rock's next festival) attended the International Festival of Poetry of Resistance in Toronto recently and sent us some photographs and insights. For those who don't know, the Cuban Five are a group of artists who are imprisoned in the United States after being accused of and convicted of conspiracy to commit espionage. More information about them can be found here. The intent of the festival was to celebrate resistance, to promote the end of the culture of war, and to promote an end to racism and discrimination. The festival's statement of principles and further information can be found here. 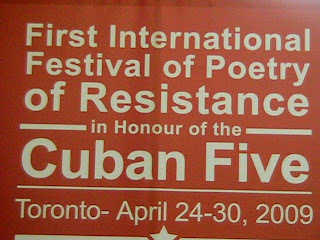 During the festival, many poets and musicians turned out in support of the Cuban Five. 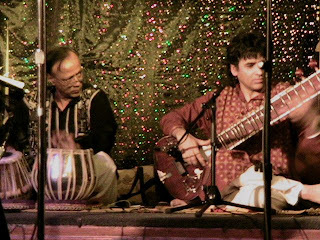 Allison Hedge Coke tells us that the crowd was "absolutely mesmerized by poet and co-organizer Asoke Chakravarty on tabla and Anwar Khurshid on sitar. Anwar's hands moved so fast at one point, they were difficult to see. Osaze Dolabaille played some Calypso and drummed as he read poetry. 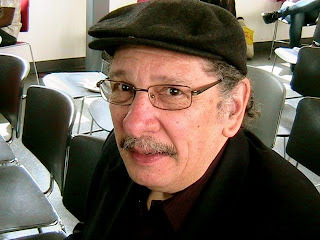 Poet Carlos Angulo was one of many poets to read, including co-organizer Maria Elena, Allison Hedge Coke, Nancy Morejon, Pablo Armando Fernández, and many more. Thomas Maracle, musician and flautist, Mohawk of the Six Nations Confederacy of Tyendenaga, played several songs on various (very beautiful) flutes. Elizabeth Palmeiro, wife of Ramón Labañino, one of the Cuban Five was present. She spoke about her husband's imprisonment, about the four other families affected, and the two wives who were denied US visas to visit their husbands. The crowd cheered with support when she appeared on stage. Dan Doreen, War Society of the Mohawk of the Six Nations Confederacy of Tyendenaga, gifted Elizabeth with a solidarity gift at Innis Hall, Innis College, U of Toronto, on Wednesday night for the 50th Anniversary of the Cuban Revolution. We are inspired by this sister festival and grateful to Allison for her report and photos. Please keep the news of poetry and resistance coming. We've extended the deadline for proposals for panels, workshops, and sundry exciting festival events. Please spread the word - and send us your fabulous ideas. Thanks! The "Call" is below, for your convenience, with a link to the full guidelines. Split This Rock Poetry Festival: Poems of Provocation & Witness invites poets, writers, activists, and all concerned citizens to Washington, DC, March 10-13, 2010 for four days of poetry, community building, and creative transformation as our country continues to grapple with two wars, a crippling economic crisis, and other social and environmental ills. The festival will feature readings, workshops, panel discussions, youth programming, film, activism -- opportunities to imagine a way forward, hone our community and activist skills, and celebrate the many ways that poetry can act as an agent for social change.We invite you to send proposals for panel discussions, group readings, roundtable discussions, workshops, and small-scale performances on a range of topics at the intersection of poetry and social change. Possibilities are endless. Challenge us. NEW DEADLINE: June 30, 2009. Discussion and community building are at the heart of Split This Rock. We value diversity, creativity, and new ideas. Check out last year's schedule for inspiration: www.splitthisrock.org/schedule.html. Forward this email, post it on your blog, send a message to all your Facebook friends. We are a grassroots movement and need your help to reach a wide variety of poets and poetry lovers. Thanks! 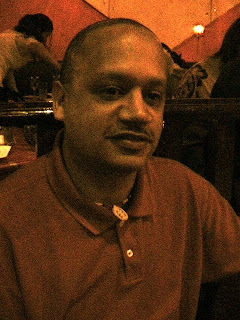 The fabulous poet and Split This Rocker Regie Cabico profiled in the DC Commission on the Arts & Humanities May 2009 Newsletter. Marion Kingston Stocking, long-time editor of the Beloit Poetry Journal, died peacefully on May 12 after a four-month bout with non-Hodgkins lymphoma. During her 56-years with the BPJ, a tenure unequaled, we believe, in small-press literary publishing, Marion wrote 198 reviews and helped to shepherd 225 issues of the journal into existence. Since the hole she leaves as editor, friend, engaged citizen, and mentor is too big to fill, we’ll have to carry her with us as we go about living fully and generously.